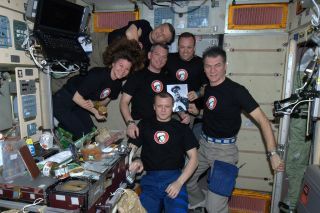 Spaceflyers onboard the International Space Station do dinner and a movie for Yuri's Night on April 12, 2011. NEW YORK – Space lovers worldwide and beyond celebrated the 50th anniversary of the first human spaceflight Tuesday (April 12) with Yuri's Night parties. About 200 people came to New York City's Yuri's Night party at Cielo Club in the Meatpacking district. SPACE.com managing editor Tariq Malik poses next to a picture of Yuri Gagarin at New York City's Yuri's Night party on April 12, 2011. "We drew a much more diverse, interesting crowd than we have in the past," said Elizabeth Kennick, who organized New York's event along with the Space Frontier Foundation. "On a Tuesday night, when it rained, I was really pleased." The party featured space go-go dancers, a space trivia contest, and other out-of-this-world elements. The crowd included people in spacesuits and glow-in-the-dark fashions. Space-themed drinks, such as the "Salty Laika" (named after Laika, a Soviet dog that became the first animal to orbit Earth), were flowing during repeated vodka toasts to Yuri. "It was a great event and certainly a different way to celebrate such an historical achievement," attendee James Finklea, 30, of Stamford, Conn., told SPACE.com. Many New Yorkers were particularly animated after the announcement that afternoon that the Big Apple's own Intrepid Museum of Sea, Air and Space would receive the space shuttle orbiter Enterprise after NASA's shuttles are retired this summer. Some attendees were thrilled, but others complained that Enterprise never reached space, since it was used only for glide tests before the first shuttle launch. Revelers at New York City's Yuri's Night party wear glow-in-the-dark costumes. "I expected people to be delighted, jumping up and down," Kennick said. "The number one most frequent comment I got was, 'Oh, but it's not a real shuttle.' Honestly, I'm delighted that we got Enterprise." A total of 550 Yuri's Night events in 74 countries took place, according to the site YurisNight.net. The festivities even extended to space, where the six astronauts living on the International Space Station donned Yuri Gagarin t-shirts and gathered for dinner and a movie in honor of Yuri's Night.